Data from a Display Group can be exported into a CSV (Comma-Separated Values) file for offline processing in third-party applications like Microsoft Excel. After highlighting the Display Group to be exported in the Display Group List, click the Export tab in the Display Group Details Area. 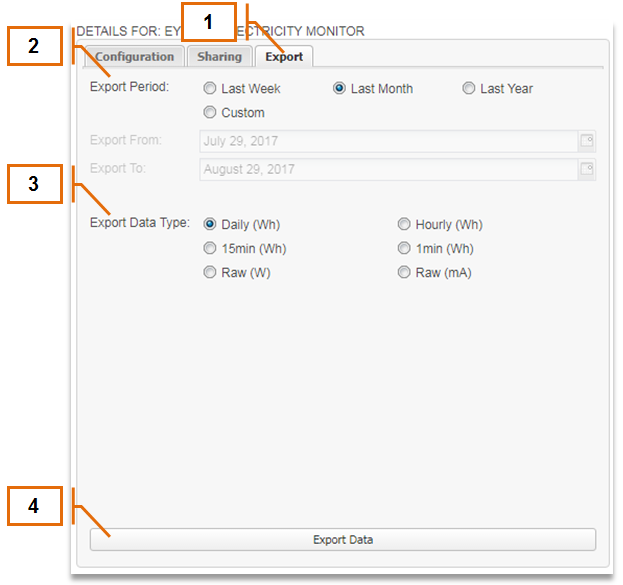 Select the Export Period or specify a custom date range. Select the Export Data Type. Note that not all data types are available for all Devices. Click the “Export Data” button to initiate the export. A file download should begin automatically containing all reading data for the selected Display Group within the selected export period. NOTE: When exporting Raw Data Types, it is possible that not all sensors will have the same number of data points or have their readings on the same time boundaries. The output format will be dependent on the specific Devices. Raw Data Types should be limited to short export periods to avoid very large export file sizes.